After my cry for help last month wherein I described how my life had slipped into a greasy wrench-a-thon, all but entirely devoid of human contact, many readers came to my aid to suggest a way out. And now, thanks to you, I’ve got a wrenching plan for 2016. Last month, I asked Jalopnik readers if I was in over my head. After reading through the copious problems with my fleet and seeing the dump that is my garage (see below), you all seemed to agree: I had gone off the deep end. But because Jalopnik readers are the best, everyone offered suggestions on how to get my life back together. So this year, 2016, I will follow readers’ advice and emerge from the dark pits of my garage. As you might recall, I currently own five automobiles. I’ve got a ‘92 Jeep XJ with a blown up engine, a ‘95 rust-bucket Moab-bound XJ, a pristine ‘96 manual XJ, a 1985 Jeep J10 with a blown transmission and the most unreliable Honda in the world (a 1995 Accord). Clearly, I need to thin the herd, and to do so, I’m following instructions from you, our illustrious readers. Many people suggested that I ditch the Honda and two XJs, leaving me with a single XJ and the J10 pickup, and that’s what I’ve decided to do. 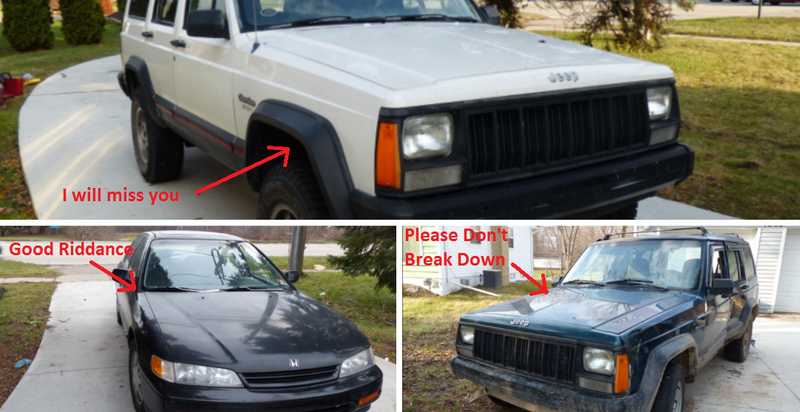 That means the three vehicles on the chopping block are: the Honda, the $600 XJ and the white ‘96 manual XJ. The $600 XJ was never meant to be a permanent fixture in my driveway, so I’ll spend three months wrenching on it hard, take it to Moab and then either drive it in a demolition derby or sell it. The one car I’ll miss is the manual XJ, but it should fetch me some decent coin, which I can then spend on my beloved J-truck and ‘92 XJ. In the end, I’ll only have two cars and my biggest issue will be figuring out how to prevent myself from relapsing on Craigslist. So there you have it. Those are my project plans for 2016. What are yours?